The OnePlus 2 has an upgraded camera for more accurate photos, according to the company. Chinese vendor OnePlus has done it again, and produced a powerful smartphone at a bargain price. The company unveiled its second-generation Android phone, the OnePlus 2, on Tuesday. It comes with all the cutting-edge specs you'd expect from a flagship handset, but starts at only $329 when bought without a contract -- about half the cost of an iPhone 6. Over a year ago, the Chinese vendor made waves using the same strategy with its first phone, which earned rave reviews. 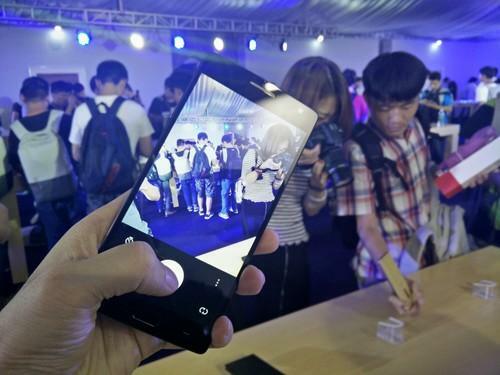 The device sold in China, but also in the U.S., where OnePlus has gained a loyal following. I had a chance to try the new product, and found that it slightly refines everything great about the first phone, but throws in a fingerprint scanner, along with a more polished metal frame. Oddly, this left me with some mixed feelings. The OnePlus 2 has Qualcomm's Snapdragon 810 processor, a 1080p, 5.5-inch screen, and a 13-megapixel rear-facing camera. Models are available with either 3GB or 4GB of RAM, and the phone has a rather large battery at 3300 mAh. Although some Chinese brands have a reputation for shoddy products, the same can't be said of OnePlus. With the OnePlus 2, the company has created a phone that feels expensive, with a choice of five different back covers, made of either Kevlar, sandstone, or wood. So why the mixed feelings? As an owner of the first OnePlus phone, it's hard to see why I should upgrade, even with a slightly improved camera and the addition of a fingerprint scanner: The first phone was so good. The OnePlus 2 is a millimeter shorter and narrower than its predecessor, but also a bit thicker, giving the phone some unwanted heft. The company also decided to place both the volume and power button on the right side, a design choice that could take getting used to. On the left side is now a special "alert slider", that lets the user switch between different notification settings. A user, for instance, can easily switch between a silent mode, to another setting, where only incoming calls from personal contacts will force the phone to ring. It's a nice feature, but nothing I really need. However, given that the phone is slightly more compact, using the OnePlus 2 with one hand is a little easier, when compared with the last generation. The company also decided to retain a 1080p screen with the OnePlus 2, instead of upgrading to a higher pixel resolution, as a way to save on battery life. That doesn't mean the new phone's display hasn't been upgraded. According to the company, it can produce clearer images. But in my brief time with the device, I didn't notice any major difference. Customers who do decide to buy the OnePlus 2 will be relieved to know that the company seems to have solved the reported heating issues with Qualcomm's Snapdragon 810 processor. The unit I used only felt a little warm on the back, but nothing I would complain about. The fingerprint scanner also functions quite well, and can activate the phone in less than a second. Buying the phone won't be easy. OnePlus is still a young company and has limited manufacturing capacity. For now, the OnePlus 2 will only be available for customers who have received a company invite. It goes on sale Aug. 11, and can be bought with 16 GB of storage and 3 GB of RAM at $329, or 64 GB of storage and 4 GB of RAM for $389.